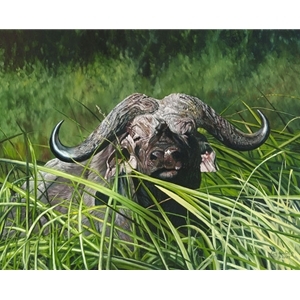 "He's one of the Cape Buffalo I encountered at a wildlife sanctuary near my home in Kenya. While this particular animal had no connection to the death of my father, the process of creating this painting was a mountain to climb that put so much into perpective. As much as any other animal, the Cape Buffalo embodies the promise of life, danger and wildness that is Africa. My father would have loved this painting."